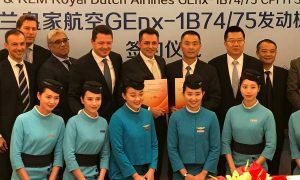 Boeing and Xiamen Airlines celebrated the delivery of the airline’s first 787 Dreamliner. Formed in 1984 as China’s first joint venture between the Civil Aviation Administration of China (CAAC) and a municipal government, Xiamen Airlines started services in 1985 with two 737-200s serving three cities. The carrier has grown into China’s sixth largest airline serving 218 domestic routes and 26 international and regional routes. Xiamen Airlines launches first long haul route to U.S.